Tektronix, Inc., a leading worldwide provider of test, measurement and monitoring instrumentation, has introduced version 2.0 of its Certus ASIC prototyping debug solution. A suite of software and RTL-based embedded instruments, Certus 2.0 fundamentally changes the ASIC prototyping flow by enabling full RTL-level visibility and making FPGA internal visibility a feature of the prototyping platform. This simulation-level visibility allows engineers to diagnose multiple defects in a day versus a week or more with existing tools. A major challenge today is that traditional FPGA debug tools are unable to support the requirements of the ASIC prototyping market, particularly as designs have become larger and span multiple FPGA devices. Add the increased complexity of hardware/software interactions and the high-speed operation of most prototypes, and FPGA debug has become a major bottleneck in the ASIC prototyping process. Now, by using Certus 2.0 to pre-instrument up to one hundred thousand signals per FPGA device, designers gain comprehensive RTL-level signal visibility without time consuming synthesis and place and route cycles, allowing complex problems to be pinpointed and resolved quickly. As a leading supplier of FPGA development and ASIC prototype boards, the Dini Group is at the forefront of ASIC prototyping trends and well acquainted with ASIC prototype debug challenges. "Proactive debug capability for ASIC prototypes has been a missing ingredient within the FPGA ecosystem," said Mike Dini, founder and president of the Dini Group. "With Certus 2.0 we can instrument the design up front, enabling us to quickly view the full operation of the design during a single debug session and resolve issues in a fraction of the time it takes with traditional tools. What's more it works with all of our existing boards - no need to wait in order to take advantage of all these critical features." 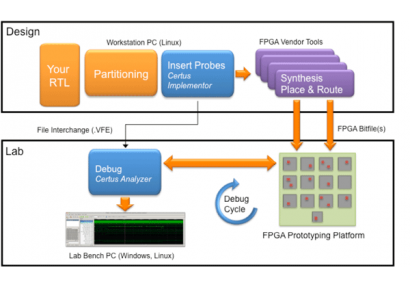 "Certus 2.0 fundamentally changes the ASIC prototyping flow and dramatically increases debug productivity," said Brad Quinton, chief architect for the embedded instrumentation group at Tektronix. "Because we are now delivering RTL-level visibility of up to a hundred thousand signals spanning the entire design, the debugging use case is comparable to RTL simulation. This enables the direct debugging of hardware and software on the ASIC prototype without going back to simulation, emulation or acceleration platforms, changing the economics of ASIC silicon-based verification." Certus 2.0 works on any existing commercial or custom ASIC prototyping platform, and does not need special connectors, cables, or external hardware. In addition, Certus 2.0 does not limit the operating speed of the prototype platform. Following the acquisition of Veridae Systems last year, Tektronix Embedded Instrumentation solutions reflect the growing importance of Electronic Design Automation (EDA) software in helping engineers solve difficult instrumentation and debug challenges. As the release of a new version of Certus demonstrates, Tektronix is committed to strategic investment in EDA software-driven debug automation solutions that enable the validation of correct operation and the determination of the root cause of any issues faster in a unified and productive environment. The Certus 2.0 ASIC prototyping debug solution is available now and is priced at $19,500 U.S. MSRP for a one year term-based floating license.